City Council candidates Martine Watkins, Mayor Cynthia Mathews, Chris Krohn and Sandy Brown (pictured left to right) were elected to two year terms on the Santa Cruz City Council. 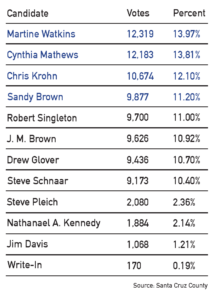 Brown overtook Robert Singleton in recent days as mail-in ballots were counted. Though the County of Santa Cruz’s Election Department says that 100 percent of votes are accounted for, these are not the final and official results.